Another positive month, with an improving stock market lifting my retirement savings account (+$27,716 or 3.81%) and boosting my geared stock portfolios considerably (+39,285 or 30.46% due to the high gearing ratio). Our house price estimate was almost unchanged this month (+$777 or 0.11%). As usual I left the estimated value for the rural property at the valuation used for the transfer of the property to my name last year. 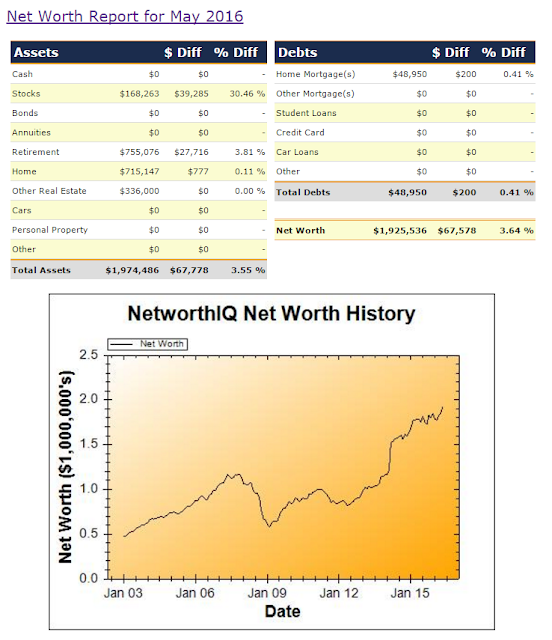 Overall my net worth reached $1,925,536 (+$67,578 or 3.64%), so I may soon hit $2m and become a 'multi-millionaire'.